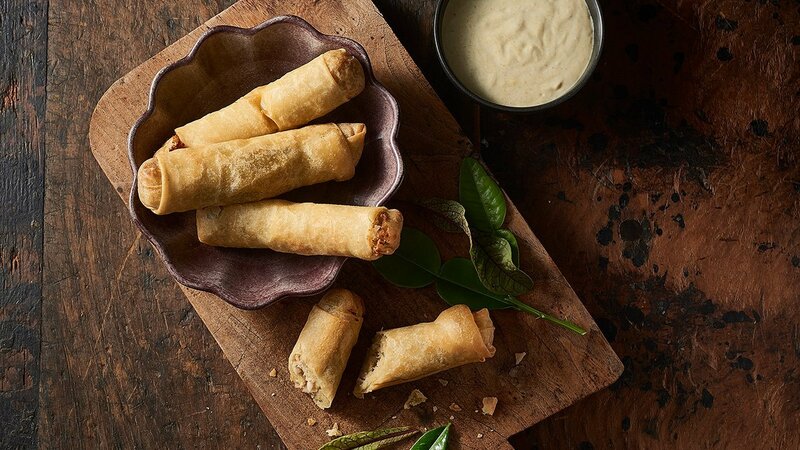 Thai green chicken wrapped in spring roll pastry – fried until crisp golden brown!! Shut up and take my money!! Seal chicken off in a pot. Add in KNORR Thai Green Curry Paste, fish sauce, caster sugar, KNORR Thai Coconut Milk Powder, and bring to the boil and simmer until chicken is cooked. Once cooked slowly add in the KNORR Instant Mashed Potato Mix to thicken. Once resembles a thick mix, set aside to cool. NOTE: Mix must be cold to work with. Combine KNORR Green Curry Paste and HELLMANN'S Real Mayonnaise. Encapsulate the filling with a spring roll pastry. Folding in the traditional way - using egg wash to ensure the pastry sticks together. Fry in deep fryer until golden brown to serve. Green Curry Mayo dipping sauce.